The brook trout, Salvelinus fontinalis, is a sport fish native to the eastern United States and eastern Canada. Although not native to Utah, the brook trout has become established in many of Utah's cold higher-elevation lakes and streams. The brilliant coloration of the species, including the red and yellow spots on the sides of the body, makes the brook trout one of the most beautiful fishes in Utah. The brook trout primarily eats invertebrates, including insects and zooplankton, but large individuals occasionally eat small fishes. The species spawns in the fall over gravel substrate in lakes and streams. Eggs hatch in about two months. In Utah, successful reproduction of brook trout can often lead to overcrowding, and consequently, a large number of stunted (small) individuals. The overcrowding problem can be exacerbated by low fishing pressure in the brook trout's high elevation habitat. Brook Trout are one of Utah's most beautiful trout species, even though technically they are not actually in the trout family. They are in fact, char, which is the same family as	the Arctic Char & Lake Trout (Mackinaw). They are prevalent in Utah's higher mountain lakes & streams, such as in the Boulder Mountains and the High Uintas, and often overpopulate a lake or stream and stunt. 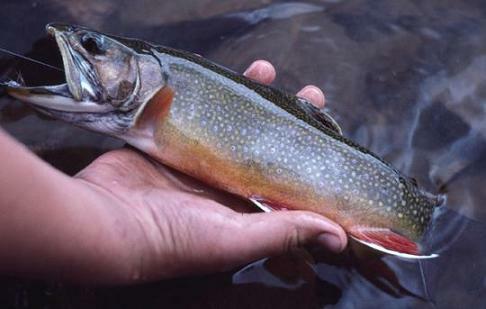 Dozens if not hundreds of streams and lakes in the High Uintas and Boulder Mountains are overflowing with small brook trout, and could use some angler harvest. A 12 incher is huge in many of these areas, where most fish run 6 to 10 inches long, however you can catch dozens or hundreds of them in a day until your hands are too tired of taking them off the hook. Beautiful Brook Trout caught in the High Uintas. 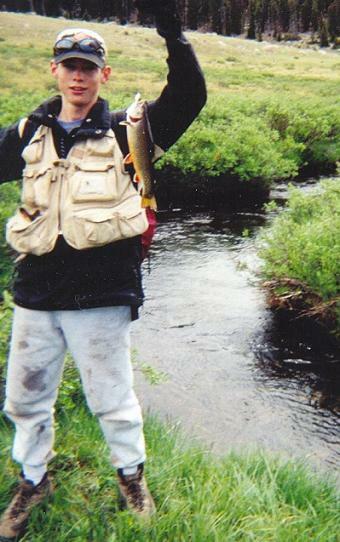 Brook Trout will readily take many types of flies, as well as small spinners such as Mepps or Blue Fox. If you are visiting some of these high mountain lakes, you will not need any bait. You often can't keep them off your line no matter what you put out there. Brook trout may be olive to blue-gray on the back to white on the belly. Red spots, usually with bluish halos around them, are present on the sides. Characteristic light wavy marks on the back are a distinguishing feature. Obvious white and then black stripe along the fore edge of each of the lower fins aids in separating brook trout from most other trout. Caudal fin is square or lightly forked.